Dr Ian Richards, Independent Consultant, Ecopt. 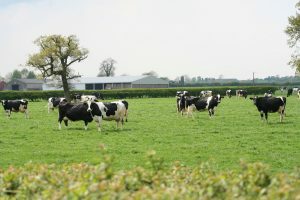 The 13 or so essential nutrients for plants are grouped, in fertiliser regulations, into primary nutrients (nitrogen, phosphate and potash), secondary nutrients (calcium, magnesium, sulphur and sodium) and micronutrients (manganese, copper, boron etc) according roughly to the amounts needed by crops. Don’t be deceived by the term ‘secondary’; a deficiency in any of the nutrients can affect crop yield or quality, or both. An adequate supply of magnesium is just as important as one of nitrogen. The main roles of magnesium in plants are in the formation of chlorophyll and of enzyme activators. Photosynthesis, protein formation and energy transfer all depend, in part, on an adequate supply of magnesium. It is taken up by plants as the ion Mg2+ and is mobile once in the plant, so can move from older to younger tissues. Deficiency therefore tends to be seen first in the older leaves when the concentration in the dry matter falls below 0.2% Mg.
An early symptom of deficiency is the loss of a healthy green colour between veins, followed by yellowing (chlorosis), which starts at the leaf tips and margins and spreads until the entire leaf is affected. Symptoms can be confused with nitrogen or manganese deficiency but often are more mottled with darker and lighter green in cereals. Some plants, e.g. strawberries, can develop orange or reddish colouring of leaves. Many cereal crops develop short-lived magnesium deficiency symptoms in early spring, but these often disappear and are not always followed by any effect on yield. Crop offtake can vary with the magnesium supply and growing conditions, but is usually around 30-40 kg MgO/ha in combinable crops. As not all the available soil nutrient is taken up by a crop, and some that is taken up is left behind in roots, stubble, straw/haulm, this probably is equivalent to a required supply from all sources in the soil of 50-60 kg MgO/ha. 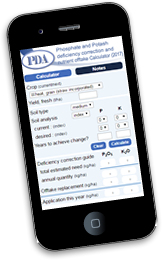 Soil usually contains between 0.05 and 0.5% total Mg but only a small proportion is in forms available for plant uptake. Available magnesium is in the soil solution and it is held on the exchange sites of clays and organic matter (“exchangeable magnesium”), like potassium. However, unlike potassium, magnesium does not move from the non-exchangeable to the exchangeable forms easily. Very high levels of magnesium in the soil, as shown by the soil index, can cause concern. In some areas, regular use of magnesian limestone over many years has increased soil magnesium. However, in other areas, high soil magnesium is naturally occurring due to the parent material. In general, high soil magnesium concentrations do not damage crop growth, but may hinder the uptake of potassium. So, where soil magnesium is felt to be excessively high (index 4 and above), the first step should be to check if this is due to applications of lime containing magnesium. If so, calcitic limes (chalk) should be substituted, and crop offtake will reduce soil magnesium over time. For naturally high magnesium soils, repeated applications of gypsum (calcium sulphate) over a period of years, may provide the reduction. It is often said that where exchangeable magnesium is very high, the workability of heavy soils is reduced. The common response is to apply gypsum (calcium sulphate) to reduce the magnesium levels, but there appears to be little or no scientific evidence that high magnesium is the cause, despite reports of improvements on farm. Overall, potential deficiency is a more important issue than too much magnesium. As all crops require magnesium, all will potentially respond to applications where the soil is deficient. 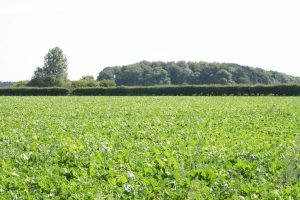 Crops vary in their sensitivity to low soil magnesium and those most likely to show yield responses are sugar beet, potatoes and field legumes. These tend to be grown on lighter soils where exchangeable magnesium concentrations are most likely to be low and where summer drought can affect uptake. In sugar beet, visible deficiency symptoms that can lead to yield loss usually appear from July onwards. Leaf analysis generally shows 0.10–0.15% Mg in dry-matter in deficient plants and 0.25–0.60% Mg in healthy plants. At soil index 0, yield responses of up to 2 t sugar/ha to 100 kg Mg/ha as kieserite have been reported. In potatoes, magnesium deficiency appears as yellowing of interveinal areas on the leaf and, in severe cases, stunting and premature senescence. At flowering, <0.15% Mg in dry-matter of the whole leaf indicates deficiency and >0.26% Mg healthy plants. Varietal differences in susceptibility to magnesium deficiency have been reported. Determinate varieties, such as Estima, that produce relatively few leaves, might be most susceptible to magnesium deficiency. Magnesium has a special role in grassland as an essential component of livestock diet, where herbage deficiency can contribute to hypomagnesaemia (grass staggers) and rapid loss of the animal. To minimize the risk, herbage concentration should not fall below 0.2% Mg in the dry matter and the K:Mg ratio should not be wider than 20:1. Also, wherever there is a risk of staggers, the herbage diet should be supplemented with magnesium, but this is normal practice. The magnesium content of fertilisers is expressed as the oxide MgO though this is just a convention like P2O5 or K2O. In fertilisers, magnesium usually is in sulphate, carbonate, oxide or, occasionally, nitrate forms or in mixtures of these. Magnesium sulphate is a readily soluble and quick acting whether applied to soil as kieserite or kainit or as a foliar spray as Epsom salts or Bittersalz. Magnesium oxide as calcined magnesite is less soluble so somewhat slower acting. Magnesium sulphate and magnesium oxide are commonly applied in blended compound fertilisers, ploughed-down in autumn for sugar beet. Another common source of magnesium is dolomitic or magnesian limestone. Typically, this contains around 20% MgO in the carbonate form. Magnesium nitrate is used sometimes for higher value crops and magnesium ammonium phosphate (struvite) and magnesium oxysulphate are used in both agriculture and horticulture. Some liquid chelated magnesium fertilisers are available. Kieserite, kainit or calcined magnesite are soil applied to maintain or build-up the soil index. If deficiency symptoms appear in a growing crop, often it is best to apply a foliar spray of magnesium sulphate or chelated magnesium. 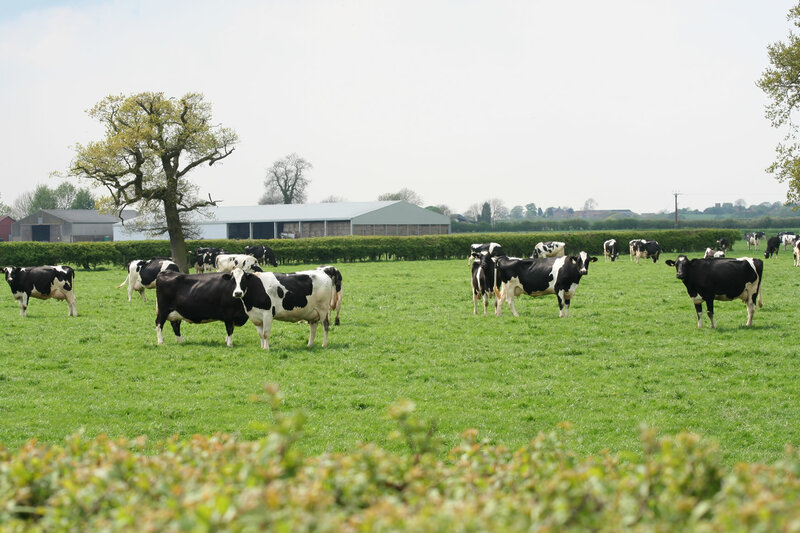 Livestock and other manures also contain magnesium and a typical application of 35 t cattle FYM/ha will provide around 60-65 kg MgO/ha. As magnesium content of manures can vary, it’s best to get a laboratory analysis done on a representative sample. For soil applications, the usual recommendations are 150 kg MgO/ha at soil index 0 and 75 (100 for field vegetables and bulbs) kg MgO/ha at index 1 for responsive crops. Application to sugar beet or potatoes usually will ensure adequate supplies for other crops in the rotation. However, where these crops are not grown, 50-100 kg MgO/ha every three to four years is recommended at index 0 for grass, forage maize, wholecrop cereals and fodder vegetables (apart from beet which should be treated like sugar beet).